KUCHING: Sarawak ‘C’ squad capitalised on the opportunity to play at homeground by thrashing SSTMI B-17 5-0. A brilliance performance by Safri Amit players is the main contributor to the success at the State Stadium in Petra Jaya on Sunday. Mohamad Adif Salim stole the attention when he scored two goals in the 36th minute and 63 minutes. Meanwhile, three other goals were from Amirrul Iqmal Bolhi in the 58 minute, Azafarezal Harun in the 82 minute and Zharif Yazin Nasruddin in the 90th minute. 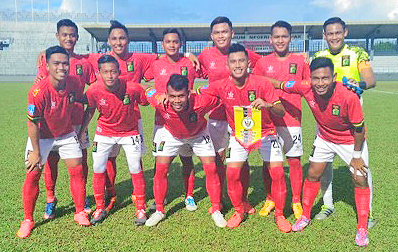 It was the fourth victory of Sarawak ‘C’ from 11 games to collect 16 points including four draws. “Our entire plan was successfully implement and the proudest moment is when players in all positions managed to perform their tasks so well,” said team coach Safri. He thanked his players for being able to play very well in the match. Safri hoped his players will be able to maintain the excellent performance against Kelantan on May 12 (Friday) at the State Stadium, here, in Petra Jaya. S’wak C crush SSTMI 5-1 0 out of 5 based on 0 ratings. 0 user reviews.